There's a sports occurrence that may be my favorite in all of sports. I realize that I've always loved it, but only recently began to recognize it as its own distinct and glorious entity. I'm calling it Fat Day. In single-site conference basketball tournaments, there's always at least one round where the day's action is a double doubleheader. Two games are played in a morning/afternoon session, and after a recess and typically the clearing of the arena, action returns for an evening session. The same scenario plays out at NCAA Tournament first/second round sites. What does that mean for the attendee? About eight net hours gets you four games, eight teams, eight fan bases, and eight pep bands, with barely the need to leave your seat. The break between sessions is typically timed for dinner, so you can poke around in the tournament city a little and grab some local fare, and then it's back in place for the evening. There's little in sports that gives you that much variety, and there's little that's as satisfying. 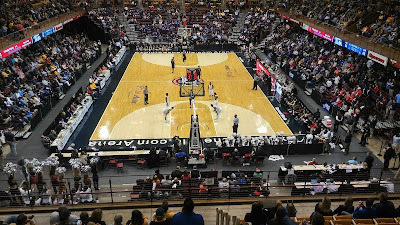 I spent Fat Day of the Southern Conference tournament - Saturday's quarterfinals - in Asheville, catching not just my employer but severn other teams, bands, and fanbases. The break took me to Wicked Weed brewery and exploring Asheville a bit on foot before returning for the evening session. I've often done the same during the ACC tournaments here in Greensboro, and did the same in Asheville back in 2012. Now that I've recognized it as its own paradigm, I'm planning future conference tournament travel around getting the most bang for my buck by catching Fat Day.